Albuquerque Historical Postcard Collection at the Special Collections Library includes more than 2,000 postcards published throughout the 20th Century. Albuquerque Historical Postcard Collection at the Special Collections Library includes more than 2,000 postcards published throughout the 20th Century. Assembled from donations received over many years, it is organized into geographical and subject categories. How this digital project began. . . In 2001, as Albuquerque hosted the national celebration of the Diamond Jubilee of the establishment of Route 66, the Library mounted an exhibit using postcards of scenes along the entire route, and featuring Rt. 66 through Albuquerque and New Mexico. 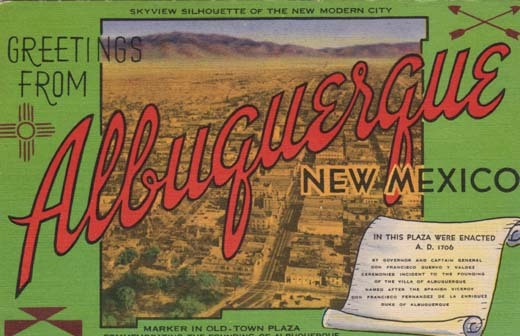 When a New Mexico Postcard Club was established in August 2004, the idea emerged for an exhibit of Albuquerque postcards as part of the City's Tricentennial Celebration. This resulted in a traveling exhibit with 30 panels of 24 cards each, rotating throughout the Public Library Albuquerque and Bernalillo County. The exhibit included postcards from collections of the Library, the Albuquerque Museum, University of New Mexico, New Mexico State University, and eight members of the New Mexico Postcard Club. The Public Library has organized its original cards and a large group of color photocopies of cards from the traveling exhibit into 26 categories used for the individual display panels. These images have proved so valuable in providing local history information that we are now working to create a digital database for enhanced public access. The Public Library does not claim ownership of any copyrights to images on this site. These images are intended for personal or research use only. Any other use, including but not limited to commercial or scholarly publication in any medium or format, public exhibition, or use online or in a web site, may be subject to additional restrictions including but not limited to the copyrights held by parties other than the Public Library. USERS ARE SOLELY RESPONSIBLE for determining the existence of such rights and for obtaining any permission and/or paying associated fees necessary for the proposed use.